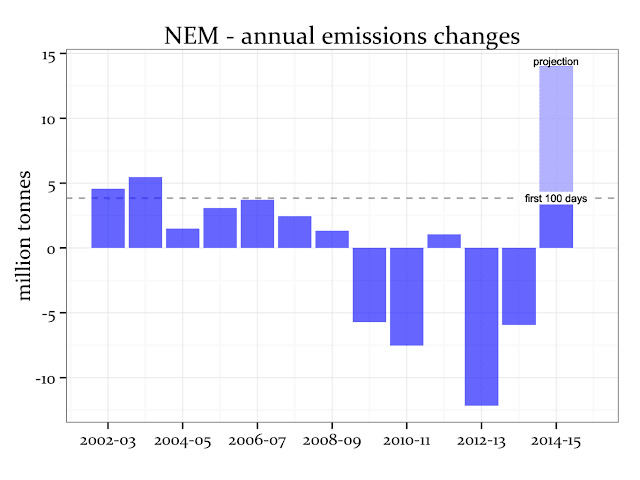 Emissions from the electricity sector are now showing a clear increasing trend. The latest Pitt and Sherry CEDEX report shows that emissions from burning black and brown coal has increased and this has at least partly been attributed to the abolition of the carbon Price. September's emissions were 1.3 per cent higher than the month to June 2014 when carbon pricing was in place. What was a slight rise in July-August, which was the largest 2 month increase since 2006, has now been clearly confirmed in the September data. "This change in trend has coincided with, but is not entirely caused by, the removal of the carbon price. Other factors include reduced gas generation in NSW, Victoria and SA, presumably related to higher wholesale gas prices, though it remained high in Queensland where cheap “ramp gas is likely to be available for a little longer. There was also considerably less wind generation in both August and September this year, compared with the same months in 2013. Black coal generation was 0.5% higher in the year to September 2014 than in the year to June, and brown coal generation was 2.2% higher." Total annual NEM demand has fallen more slowly over the past three months than it did up to last June. Demand is actually increasing in both NSW and Queensland, and is almost completely flat in SA. Demand is falling in Victoria, but if the effect of the Portland aluminium smelter closure is removed from the data, demand is on the rise there also. It appears that only in Tasmania is demand for electrical energy continuing to fall. The continued roll out of residential and small business solar PV is also capping demand to some extent. One hundred days on from the repeal of the carbon tax, we now have a new framework for emissions abatement (the Emissions Reduction Fund) and the odds are firming that we will smash previous records with an unprecedented rise in our electricity sector emissions, by around 9% this financial year. Across the National Electricity Market (NEM) we are tracking towards an extra 14 million tonnes CO2 for FY2014-15 compared to FY2013-14. If we get lower than average rain, electricity sector emissions might grow by a few more million tonnes and exceed 10% over the year. The implications for this change is that black coal and brown coal generators will be more profitable. So, while their bottom line profits increases, pollution also increases which reduces community health and adds to the cumulative impact on climate change on health and environment. At the start of the week the Abbott Government was successful in getting it's Direct Action Climate Plan passed in the Senate which will establish the $2.55 billion Emission Reduction Fund (ERF). The Palmer United Party senators, along with Victorian DLP Senator John Madigan and South Australian Independant Nick Xenophon, supported the passage of the bill which contains the Government's primary strategy of meeting Australia's commitment to a 5 per cent reduction in emissions on 2000 levels by 2020. There have been strong doubts that the ERF will be sufficient to meet this very basic target and with electricity emissions already moving upwards this will make the task that much harder. The program emphasises carbon farming, already shown to have limited potential for carbon storage on a wide basis, a tree planting program, and a reverse auction where polluters are paid to reduce their emissions. “While high benchmark prices could result in around four times the amount of abatement from industry compared to a low purchase price, the ERF alone is likely to fall short of purchasing enough emissions abatement to meet Australia’s Kyoto obligations” said Mr Grossman. “Even buoyed by a very high benchmark price we forecast that the ERF would purchase less than 120 million tonnes of greenhouse gas emissions abatement by 2020, equivalent to only 28 per cent of Australia’s abatement challenge. This leaves a considerable shortfall for the government to overcome in the final design of its scheme” said Mr Grossman. The Climate Change Authority conducted a comparative study of national and sub-national targets and action globally and recommended early this year that Australia's target should be increased to 19 per cent on 2000 levels by 2020 as our fair share. 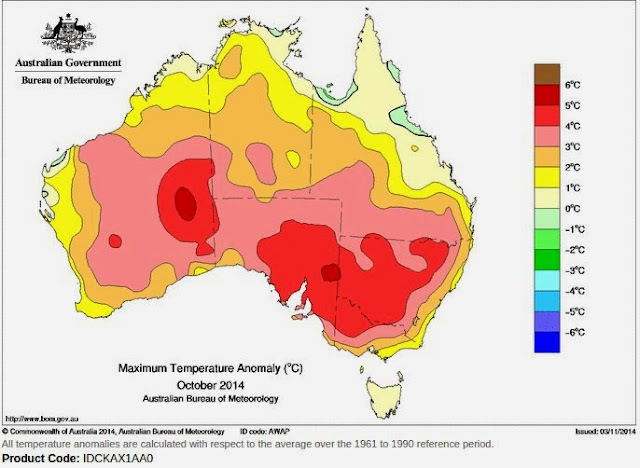 Last month was also the hottest October on record for Australia presaging a hot summer for heatwaves and bushfires, with the final IPCC 5th assessment synthesis report released on November 2 which argued that we need to rapidly reduce carbon emissions with little time left for action to avoid dangerous climate change.